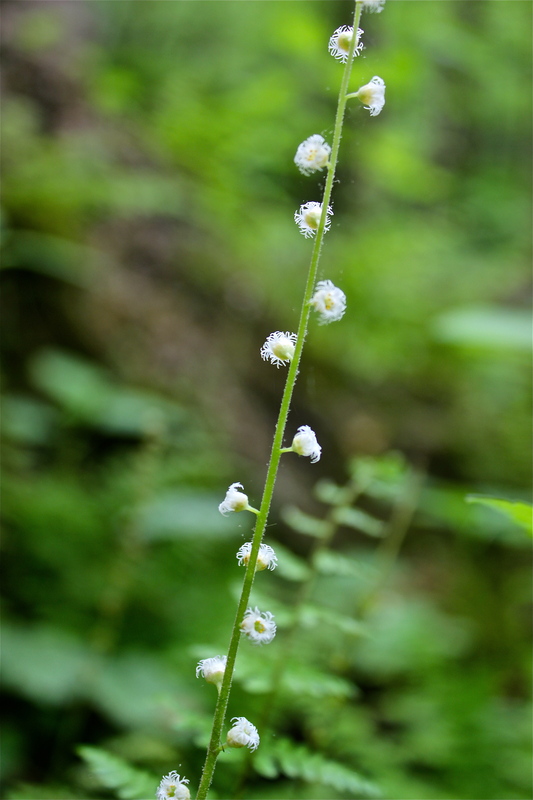 Bishop’s cap is a delicate, white wildflower that prefers moist, rich woodlands. It is content on limestone or sandstone-based soils. I’ve found it growing abundantly at Falls Ridge Preserve in Montgomery County in mid- to late spring, and also along the Blue Ridge Parkway. The name of the flower comes from the shape of the flower, which resembles a bishop’s hat. The tiny white flowers are borne on a tall stalk (10-18 inches); each flower has five petals that are fringed with “white lace”. After pollination, tiny black seeds form in little cups along the flower stem (cute!). These seeds will eventually be dispersed by raindrops. A single pair of opposite leaves grows along the flower stalk. There is a single pair of opposite, sessile leaves toward the middle of the flower stalk. The leaves at the base of the plant are 3-lobed in appearance, roughly shaped like a maple leaf, and up to 2 inches across. The images in the gallery below show the flowers, leaves, and seeds. The blurry photos are due to the fact that this wispy little plant is always set in motion by even the slightest breeze!